Creative Playrooms has always offered the highest-quality learning environment for the successful development of the total child with respect for the demanding schedules of our parents. 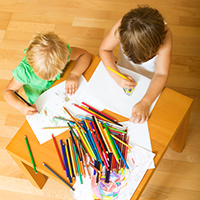 We offer full-time, part-time, and flexible childcare scheduling for our parents’ convenience. In our Infant Child Care Program, your child will receive love and individual attention in a safely-prepared environment. Infants are guided through activities encouraging sensory stimulation, motor skills, and speech skills. Our developmentally-appropriate curriculum includes reading time, puppets, finger plays, music, and table manipulative activities. The children enjoy outdoor walks, weather permitting, in our mobile stroller carriage. Our infant rooms provide soft and safe places where your child can learn to crawl, walk, and play each day. 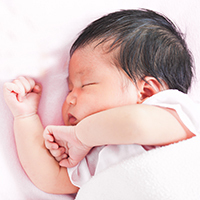 Parents provide us with their child’s individual written feeding and napping schedules. A daily report will be made available to you with information regarding your child’s meals, diaper changes, napping times, and other activities. When the time is right, your professional primary caregiver will work with you to transition your child from bottles and baby foods to sipper cups and table food. Always feel free to ask any questions you may have. Call or stop in for your own personal tour! In the Toddler Child Care Program, our Toddlers are kept very busy throughout the day! To support their growth and development through exploration, we provide the children with educational and fun activities as we rotate through our learning centers. We spend approximately 30 minutes in each of our six major learning centers: Language Arts, Science, Art, Manipulatives, Practical Life, and Gross Motor, following a weekly curriculum. Each learning center provides the children with learning opportunities that include teacher and self-directed activities, as well as one-on-one and group activities. Spanish and Baby Can Read are also incorporated into your child’s week. The Senior Toddlers can participate in Swimming. Toddlers are gaining their independence and learning self-help skills. Potty training and learning to dress themselves are big steps to our young learners. At this age, they are insistent on doing things themselves, and we encourage them to try on their own even if it takes a little longer. During this time your child is learning to drink from a regular cup and feed themselves with little or no assistance. Keeping this in mind, we ask that you please provide a full change of clothes, including shoes, to be kept in your child’s cubby. 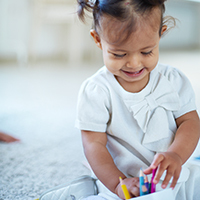 If it sounds like your Toddler will be busy learning through play and activities all day, they are! After all, the busier they are, the more they learn, and the happier they will be. We do plan special activities throughout the year such as Favorite Snack Day, Pajama Day, and Friendship Salad Day, just to name a few. Our center cook prepares a nutritious breakfast, lunch and snack each day. Please stop by or call us for a personal tour of our Toddler Program. Our Preschool Program is structured around learning centers Math & Science, Practical Life, Manipulatives, Art, and Gross Motor. We follow a weekly calendar of planned activities as the children rotate every half hour to the different learning centers. 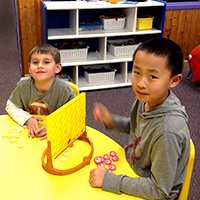 Our curriculum focuses on beginning letter and number recognition, shapes, and colors. Children participate in an introduction to Spanish class and computer labs. 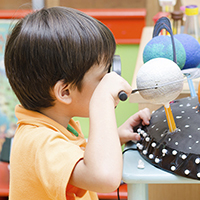 Our academic program is designed to help prepare your child for Pre-Kindergarten. Each November and April your child’s teacher will complete an evaluation designed to help identify your child’s strengths and needs. One of our goals is to teach your child to begin to become more independent. This will be accomplished through tasks such as putting toys away, dressing themselves, and washing their hands. Another main goal is socialization with other children. We will work on listening to others, helping our friends, manners, following directions, taking turns, sharing, and group activities. Your child will become more independent working with our staff. Our staff is energetic and patient, taking delight in seeing your child learn and grow. There are extra activities that your child may participate in such as Swimming, Stretch-N-Grow, and All About Dance. Our classrooms have a diversity of materials, supplies, and activities ready to spark your child’s interest! The mission of Creative Playrooms has always been to offer the highest quality learning environment for the successful development of the total child. In order to accomplish this, we have implemented a new Pre-Kindergarten curriculum which has been developed according to the Ohio Department of Education Early Learning Content Standards. These content standards include Mathematics, Language Arts, Science, and Social Studies. We follow a weekly calendar as the children rotate to different learning centers. 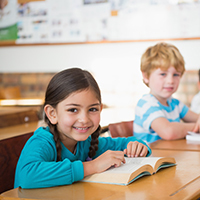 The content standards describe essential concepts and skills for young children and are aligned to the K-12 indicators, benchmarks, and standards that result in a seamless educational framework. To complement our Pre-K curriculum and give our parents a better indication of your child’s skills, abilities, and learned concepts, we have developed a new evaluation form. Your child’s teacher will conduct an evaluation in October and April, which will be followed by a parent-teacher conference. Our Pre-Kindergarten programs include Swimming, Art, Music, Spanish class, Computer Labs, and indoor and outdoor play. Children can also participate in extra activities such as All about Dance, Stretch-N-Grow, and Soccer Shots. The children enjoy Show-n-Share on Fridays. Show-n-Share gives children the opportunity to bring in and discuss an item that relates to the theme of the week. We have many special fun days that include Pajama Day, Camping Day, along with celebrations on Dr. Seuss and Frosty the Snowman’s birthday! It is our goal to help prepare your child for the upcoming Kindergarten year both academically and socially. It is the goal of Creative Playrooms Private Kindergarten to offer a top quality educational program in a safe, caring environment designed specifically for children. Our express purpose is to prepare each child for the future by meeting his/her current needs. Our Private Kindergarten classes are chartered by The Ohio Department of Education. We offer a comprehensive curriculum and instructional program which meets the Ohio Academic Content Standards in all curricular areas: Language Arts, Mathematics, Science, and Social Studies. Spanish classes, modern Computer Lab, Art, Music, Swimming, and Physical Education are also an important part of our program. Most of our children are readers by the end of the school year. The Kindergarten class enjoys field trips to places such as Patterson Farms, Cleveland Zoo, and the local library. Achievement tests are administered in September and late April of each school year, followed by Parent Teacher conferences. Regularly scheduled progress and report cards are provided. We strongly encourage regular communication between you and your child’s teacher. Through a small class size, we are able to promote self-confidence in an environment that encourages a child’s natural curiosity. The classroom atmosphere fosters the joy of learning, exploring, and growing together. Our creative cook prepares a nutritious breakfast, lunch, and snack daily. We invite you to visit our center to learn more about our Kindergarten program! Creative Playrooms provides safe, affordable care for elementary-aged children with before & after school programs. We work with local school districts to provide transportation between the center and school. We also transport to-and-from several schools using our own buses. Please contact us to discuss the services available specific to your community. Our program begins as early as 6:00 a.m. to accommodate parent work schedules. A nutritious breakfast is served up until 8:30 a.m. Upon afternoon arrival, children enjoy a healthy snack, and then participate in Art, Swimming, and indoor and outdoor play. Children can spend time in different areas that feature Lego building and fun games like Air Hockey and Foosball. We provide a specific homework area with teacher assistance. We also offer a full day program which covers most of the times your public school is closed due to Spring and Winter breaks, in-service, or inclement weather. Creative Playrooms has been providing fun and educational camp activities to children for over 45 summers! Children enroll at one of our six locations to join their friends from school to swim, make crafts, plant a garden, learn new skills, and take field trips to local attractions. Our summer camp locations include all of our locations in Independence, Maple Heights, Parma, Solon, Strongsville, and Westlake, Ohio. Cross-curricular camp activities are based on child-oriented weekly themes such as the Deep Blue Sea, Jungle Safari, and Out of this World! Camp crafts, group games, cooking activities, and science experts are just some of the ways we will be spending our summer days. At the end of the week, be ready for FUN FRIDAY! Special activities can include a luau, scavenger hunt, and Christmas in July. Creative Playrooms’ Swimming program is designed to teach children swimming skills and water safety rules. Learning to swim can help children build self-confidence, self-esteem, and inner strength. It also provides the children with additional physical exercise time. The children have a combination of swimming lessons and free swim time. Each child age 3 and above (potty trained) will have the opportunity to swim at least twice a week. An instructor certified by the American Red Cross or an equivalent Water Safety Program shall supervise all swimming. 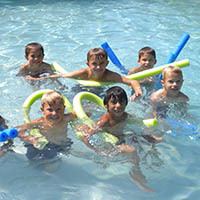 Our pool was specifically designed and built for the use of young children. The pool graduates in depth, with a maximum depth of three feet. Each child will move through the swim program at a different pace. It takes time to develop the coordination and endurance required for some strokes. Creative Playrooms must have written permission on file from the parent or guardian of the child before the child will be permitted to participate in the swim program. Soccer Shots introduces soccer exclusively to children ages 3 to 5. Using creative and imaginative games, weekly sessions focus on basic soccer skills like dribbling, passing, and shooting. Soccer Shots will expose your child to the fun of soccer and provide the foundation needed to get started in the sport. Soccer Shots is an affordable way for your child to learn about the fundamentals of soccer. See the Director to sign your child up for Soccer Shots. 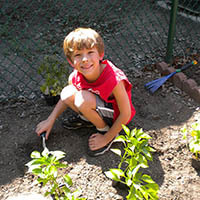 Stretch-n-Grow provides a comprehensive fitness program at an early, impressionable age. Stretch-n-Grow instructors are dedicated, talented people that have a positive impact on the health and fitness of preschool-aged children nationwide. Talk to the Director about enrolling your child in this fitness program. 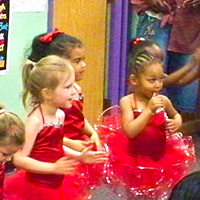 All About Dance is a dance program that brings the dance studio to your child! They are a mobile-based dance company that travels to our centers once a week for dance instruction. All About Dance offers a Preschool class that teaches ballet, tap, and jazz, as well as a Toddler Creative Movement Class. The program is designed to increase your child’s strength, balance, and flexibility while developing coordination skills and rhythmic awareness. The class includes music movement, sign-along-songs, and the use of props. All About Dance offers convenient and affordable dance lessons and is a great way for your child to learn and enjoy the art of dance! For additional information, please visit their website at www.allaboutdanceonline.com.